Captain Steven Smith passed 1,000 Test runs for the year as he guided Australia to 259-5 on the opening day of the third Test against India. 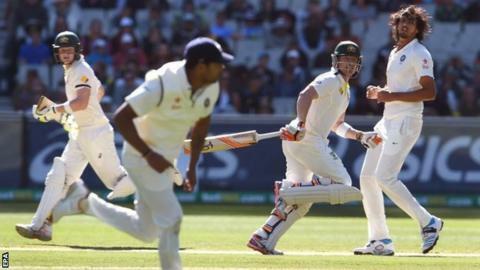 Smith made an unbeaten 72 in Melbourne and will resume on day two with Brad Haddin (23). Australia recovered from the early loss of opener David Warner who went for a duck in the second over. Chris Rogers and Shane Watson scored half-centuries before they were both dismissed after lunch. Shaun Marsh added 32 as part of a 69-run stand with his captain before he nicked Mohammed Shami behind, while debutant Joe Burns was taken by MS Dhoni for 13 as he miscued a pull off Umesh Yadav. It left the home side on 216-5, but Smith and Haddin saw Australia safely through to the end of the day. Smith has been in superb form against the tourists, making 162 in the first Test in Adelaide and then, replacing the injured Michael Clarke as skipper for the second, he scored 133 in Brisbane as Australia took an unassailable 2-0 lead in the four-match series. Rogers, who scored 57 for his third successive half-century of the series, said: "Smith is just growing day by day and it's scary to think how good he can be. "Someone threw a ball back at him today and he had the confidence to say a few words back at him, so it looks as if he knows he belongs and he knows he's one of the better players in the world at the moment."